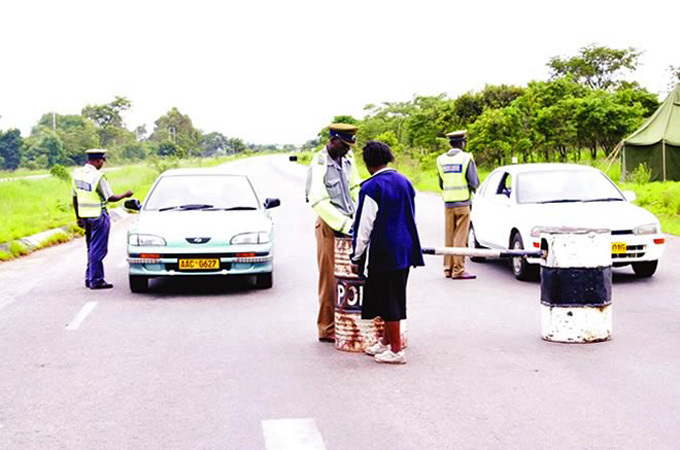 HOME Affairs Minister Cain Mathema has said police roadblocks will continue in the country's major highways as they help prevent criminal activities and bring a semblance of sanity on the roads. The minister however, promised to keep them reasonable in number saying the problem was not the roadblocks but the behaviour of some police officers manning them, who were demanding and accepting bribes, detaining motorists and unnecessarily inconveniencing the motoring public. He pledged to look into that with a view to weed out all bad apples who were denting the good image of the police and making the country unattractive to investors. He warned police officers to desist from corruption saying the Government had a zero tolerance to the vice and any officer found on the wrong side of the law risked losing their job. In an interview with Sunday News, Minister Mathema said it was important to note that no country could operate without roadblocks as they were an important part of policing not only in ensuring sanity on the country's roads but also to ensure criminals do not take advantage of their lack to further their criminal activities. He said in most cases police do not just set up roadblocks willy-nilly but it would be part of a special operation targeting certain criminal activities. "ZRP in essence operates according to the Constitution of Zimbabwe; it is an institution that was created by the Constitution, not by me, not by anybody, not even by the President. Therefore, if there are roadblocks, the police will be fulfilling their constitutional mandate and in most cases, it will be part of an operation maybe targeted at criminals, smugglers or even human traffickers. "Further, Zimbabwe is part of Interpol among other organisations inclusive of Comesa, Sadc and AU so if ZRP receives information from our partners on certain criminal activities, we will then have to set up roadblocks to help stop the criminality that might be happening and maybe in transit. To be frank, no country exists without roadblocks," said the Minister. Mathema said the police were now operating in such a manner that they did not just set up roadblocks without considering consequences to the economy of the country and protection of investors, tourists and citizens in general. "However, still on the issue of police I must hasten to warn them that we will never tolerate any acts of corruption among them, we want our police to remain at the service of the people who are there to prevent criminality and protect our citizens. They have to conduct themselves professionally and in a manner that will restore confidence in their services. Members of the public must report any officer who is seen to be acting corruptly and unprofessionally and these will surely be dealt with accordingly," said the minister. He said his ministry would work in ensuring that departments like the registry were effectively decentralised such that people could access their key documents much closer to where they stayed. "My immediate task is to ensure that all departments of Home Affairs are professionally run to serve the people of Zimbabwe especially the economy of Zimbabwe. If you look at it, all the departments in my ministry contribute to the national economy. In terms of achieving the 2030 middle income goal set by President Mnangagwa all my departments have to be involved, no single business in Zimbabwe can operate without ZRP, similarly no single business can operate without the Registry General's office to name but a few departments that fall under my ministry. "Let's not forget that even the smaller departments like the Museums and Monuments, play a huge role in our tourism sector, for example in Nyamandlovu in the Nyokeni area there are Dinosaur remains, so as from next year we will be bringing tourists to the area to help boost the country's tourism sector, that is just to show you how every department in my ministry will be fully contributing to the country's fiscus," said Minister Mathema.